introducing a sleek new lineup that looks great inside and out. 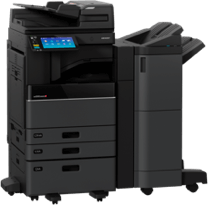 Along with an ultra-modern look, you’ll also find innovative technology like crisp, clean monochrome output delivered at up to 85 pages per minute with an impressive 6,020-sheet maximum capacity. Up to 720K maximum monthly copy volume. All our products undergo important quality controls during their manufacturing process: solidity & drop tests and water- and dustproofness tests in order to guarantee the highest customer satisfaction. We guarantee to cover the buyer against any possible defects in materials and / or assembling, subject to normal conditions of use. All MTT Mobiles mobile phones and smartphones are covered by a 2-year warranty from the date of purchase. All our accessories have a legal warranty of 6 months. Business Systems is committed to offering its clients high-quality products from trusted brands. All machines, sold or leased, are eligible for an optional, extended service contract. 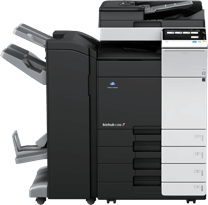 This contract is based on a cost per copy and includes maintenance to the machine and its parts, labor, retrofits, and toner- just add paper. We strongly recommend you to keep your proof of purchase or invoice in case you want to file a claim related to your product. Please note that it is possible to extend the service of your manufacturer’s warranty with our Premium Service. You will then be redirected to the secure platform of our partner bank Crédit Mutuel CIC which will enable you to proceed with the payment in total security. Crédit Mutuel CIC guarantees the confidentiality and security of your data. Get a free on-site consultation!